Hong Kong is known for its quality tailors at better prices. 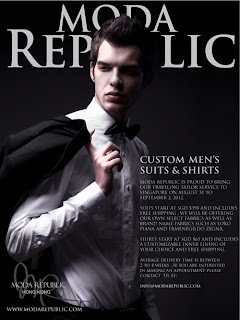 For three days only, bespoke tailor Moda Republic will be coming to Singapore from August 31 to September 2. Moda Republic will be here to do measurements as well as taking suit and shirt orders - brand name fabrics such as Loro Piana and Ermenegildo Zegna are available. If you don't have time to scuttle over to Hong Kong, this will be a great time to get your suits, shirts and jackets made. Moda Republic specializes in slim fit, European cutting, though are able to customize for more traditional suit cutting styles on request. Suits will start at SGD $390. Shirts will start at SGD $65 and includes fully customizable linings, collars, cuffs. Better yet, this includes free shipping from Hong Kong back to Singapore. The prices are about 30% lower than the other premium tailors in Hong Kong, since Moda sources their fabrics directly and have their own tailors. If you are interested, contact info@modarepublic.com with your preferred date. Details: We will do a one day pop up store event at TAB (www.tab.com.sg) from 5:30PM-10PM. Come by and get measured for a shirt or suit and remember to invite your friends... first 40 customers will enjoy a free beer! Details: Visit us in our suite at the Mandarin Oriental to view our fabrics and get measured for a suit or shirt. Thanks for the great info, I’m always looking for more inspiration for my journey to being much better at interior design, thank you!